This page is to share the accomplishments of our dogs. We have had many over the years, and will continue to track down photos and add them here as we can. After beating thousands of other entries to win the "Glamour Dog" category in the American Kennel Club's "Doggie Diva," contest Bravo moved on to the final round where he competed against 4 other dogs. Competition was fierce, but Bravo ultimately won with 10,157 votes, being crowned the American Kennel Club's official "Doggie Diva," and being featured in their magazine, website and on their Facebook page. Our own Raina being honored for performing with the "Patriotic Paws" drill team at Heartland Hospice's "Honoring our Veterans" ceremony. She performed a canine freestyle routine (tricks and dancing set to music) along with two other therapy dogs for a crowd of happy veterans. Shelly, Stacy and the Stonehill dogs have been invited to several schools to talk to the children about therapy dogs and dog training. 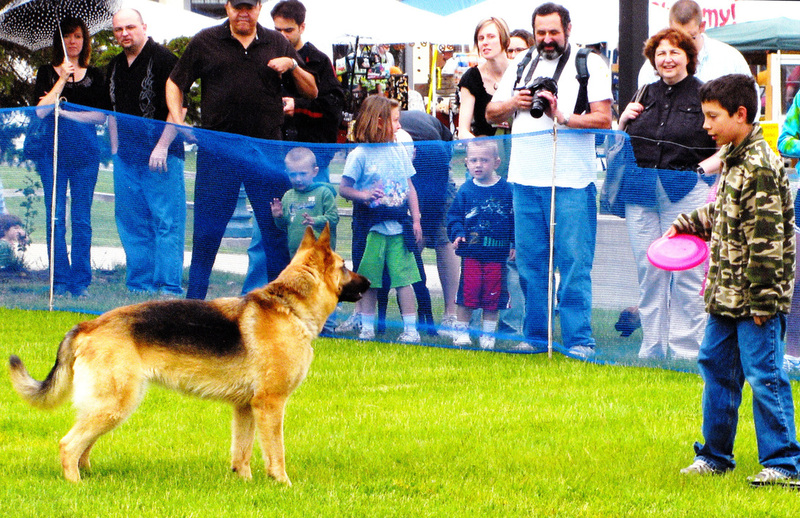 We are proud to be out in the community teaching kids about what amazing things our canine friends can do! We have given an assembly for over 300 students at Frankenmuth schools, and are pictured at left in 1 one of the 5 Kindergarten classes we visited at Pinehurst elementary. 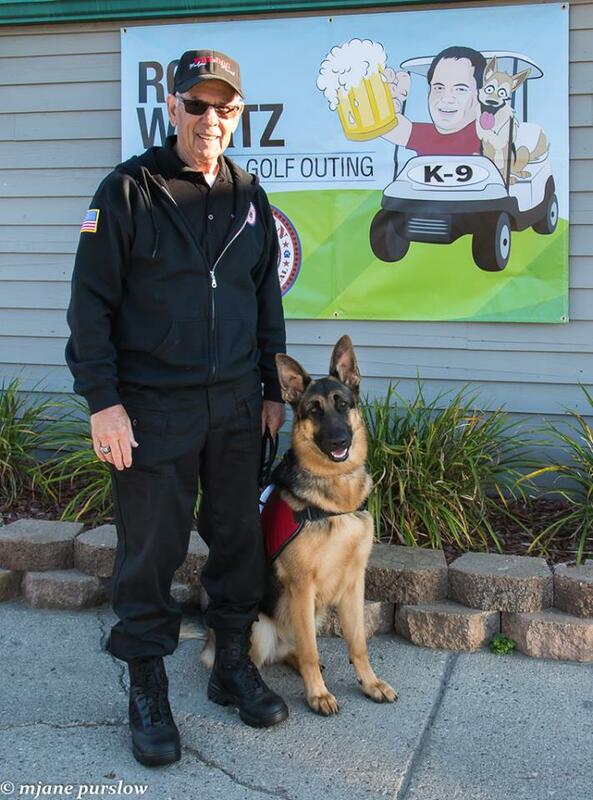 Stacy and Quantus are official team members of the Michigan War Dog Memorial K9 Salute Team. They offer their services at many burial services throughout the year for working dogs. Among many other services, they were honored to be a part of the nationally publicized memorial for Marine MWD Cena, owned and handled by Lance Cpl. Jeffrey DeYoung. Read about it here! Competed in the Frankenmuth Dog Bowl Disc Dog competition (Junior Division) with handler Antonio Gellagos and won several years in a row! Bauer is a Kahnas son. 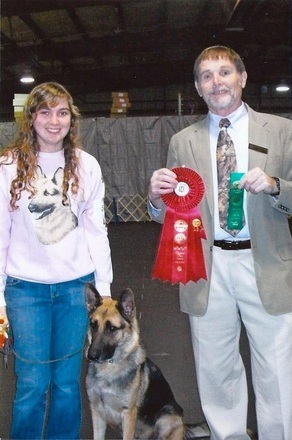 ​He is pictured here getting his level one nosework title at the C-Wags trial. Tess is a Dasa/Zander daughter. She is owned by the Weitlaufs and is the official demo dog for the Michigan War Dog Memorial, known as "The Arlington of Dogs." She travels the country helping give demonstrations on military dogs at seminars and school assemblies. Tess officially had her first "mission" in July 2017. Michigan K9 Detection, K9 "Onyx"
From owner Chris Kish: "K-9 Onyx of Michigan K-9 Detection is a dual purpose Narcotics and Patrol . I bought Onyx in 2006. He has been the work horse as a NDD for the company I work for. 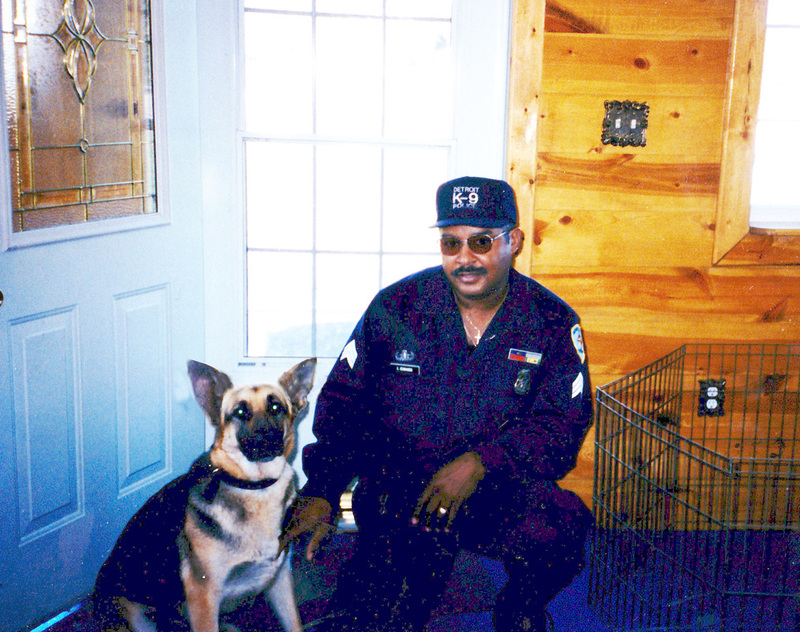 He has been instrumental in saving lives and educating the youth and public on dangers of narcotics and how a K9 can detect these odors. He is Retired as of 1-22-2014. I want to thank you for the best dog I've ever had. He was a very well balanced dog. I could go from protection details to letting him play with children. He found a lot of drugs over his career and located an elderly male that wondered from a nursing home probably saving his life. He will spend his days at home laying on the stairs waiting for me to come home. He has earned his retirement. 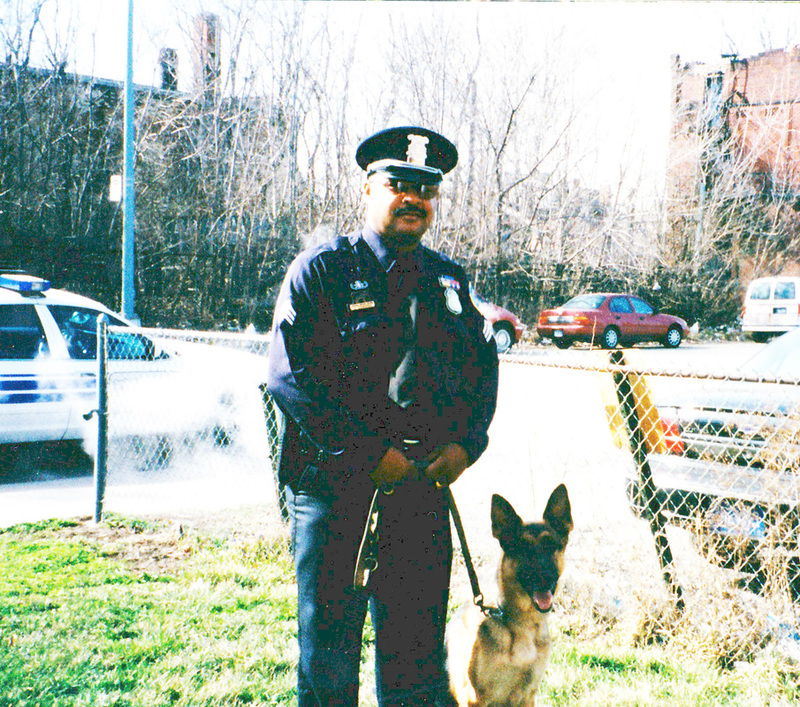 Thank you for my first and best K-9 partner. K-9 Onyx." Detroit PD, K9 "Wally." Wally had an excellent temperament. He could apprehend criminals one moment, and allow children to hug him the next. Due to this temperament, he was selected to be the poster child for Detroit PD's "Taking it to the Streets" campaign. Wally would walk around meeting people, handing out posters that said "Help Wally and friends get bullet proof vests." A Max/Fanni daughter. These photos are now ten years old, and it is hard to remember the names of every dog in every photo, so we are trying our best to find more info. This section will be updated after we look through our records for the information. The above photos are excerpts from a newspaper clipping sent from Deputy Leeseberg. 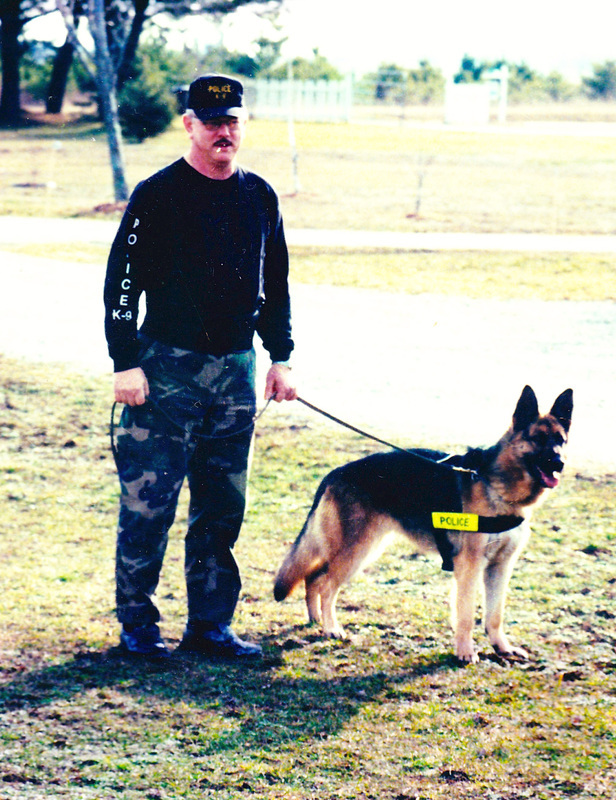 His K9, "Hunter" was dual certified in 'tracks' (Search and Rescue and suspect tracking) and narcotics detection. Hunter's arrival was such news in the city, that elementary schools in the area all voted on what his name would be. The winning name was "Hunter." Officer Leeseburg said "He'll track forever, he's got that kind of drive." A Heidi/Kahnas son. He's a K9 in training. This photo was taken at a police K9 convention. He was proud of having his own name tag. Riverview Police K9, son of Spirit and Shakti von Stonehill. This is Kahnas's littermate. 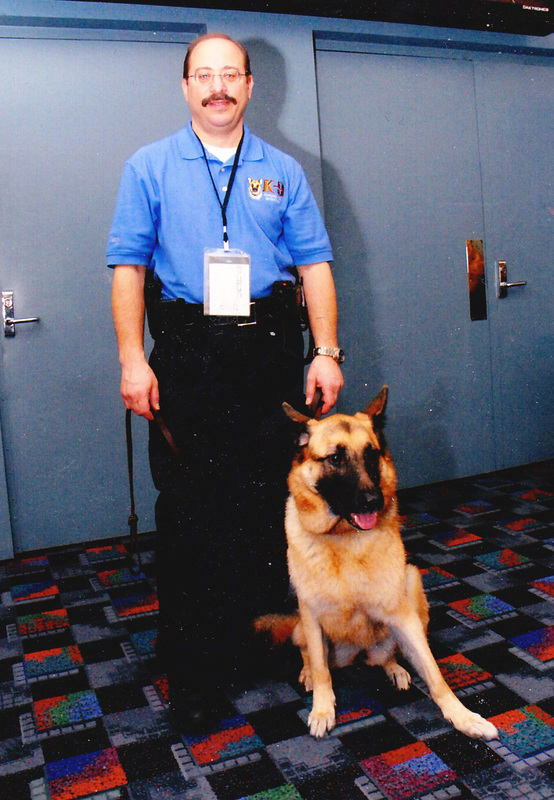 This photo is from the 2000 United States Police Canine Association trials, in which Wally took the Bronze Medal. 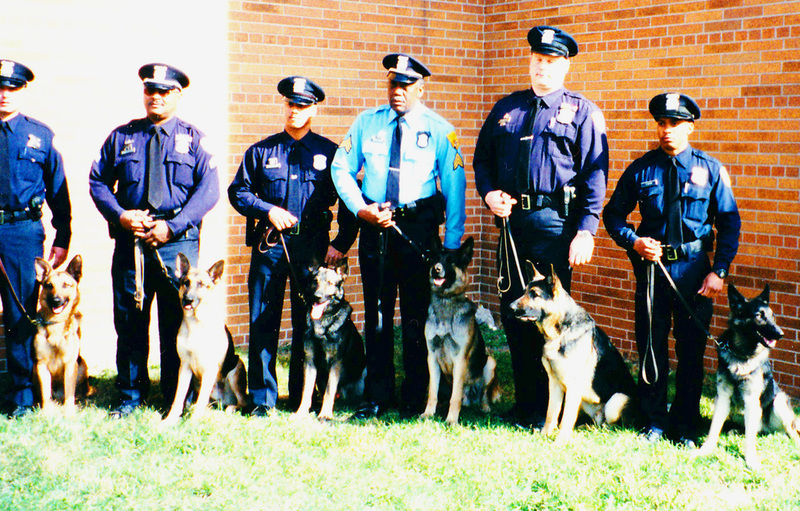 This was the first trial for both the handler and K9. 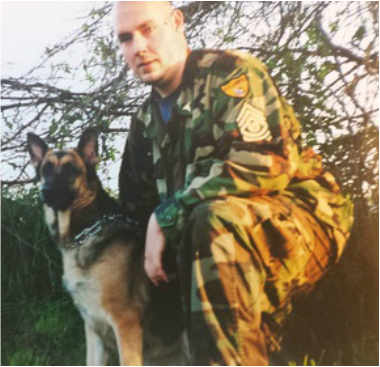 Mark says "He was a fantastic dog and one hell of a K9." 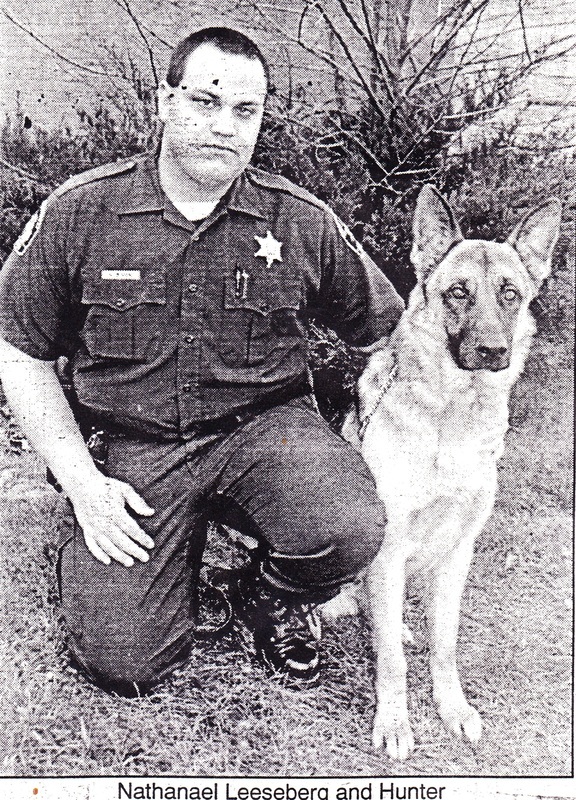 K9 "Nina," owned by deputy Stuart Rich, was a detection K9 for the Wayne County Sheriff's Department. 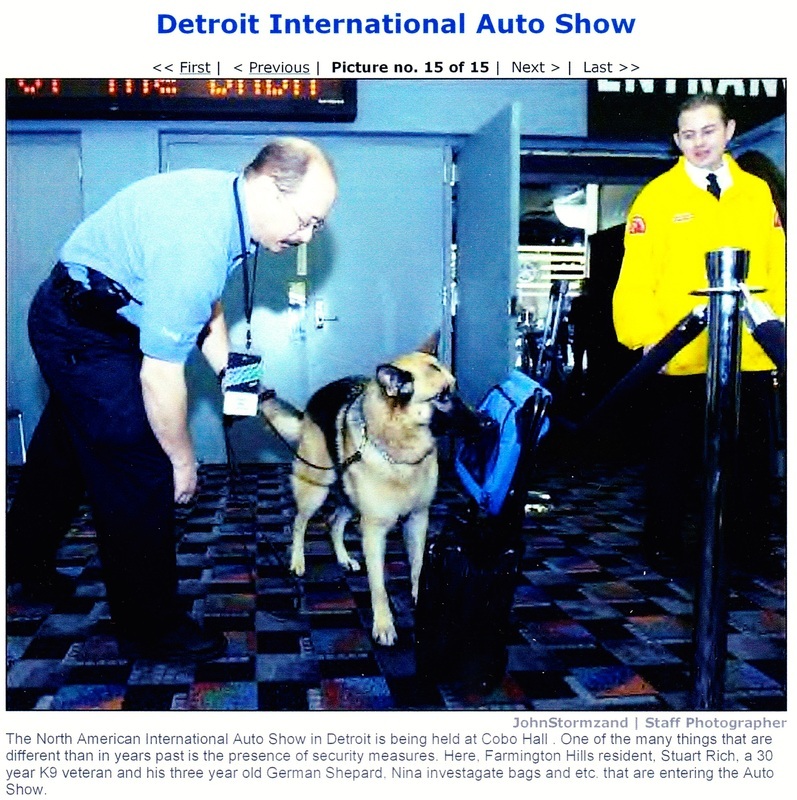 Because of her stellar temperament, she was not only one of the first detection K9's at the Detroit International Auto show, but was consistently chosen to work the event year after year. She could detect suspicious bags one moment, and kiss children the next. She was a very balanced dog and an excellent K9. 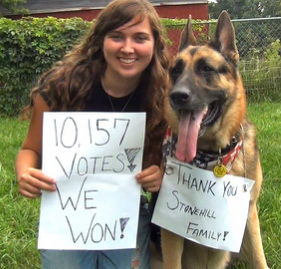 Stuart was so happy with her, that when she passed away he would go nowhere else but Stonehill for his next partner. 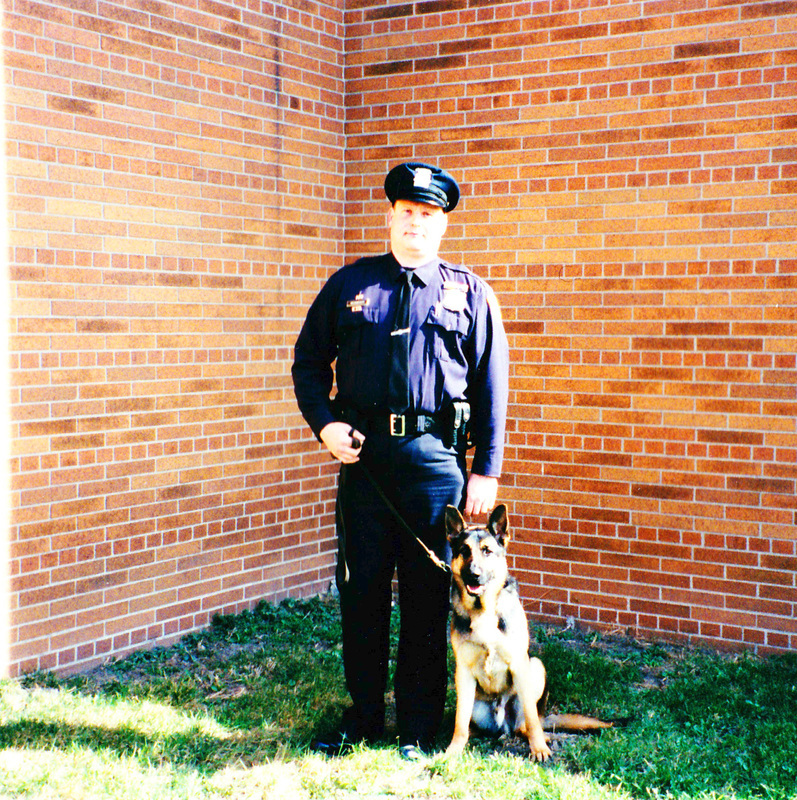 After K9 "Nina" passed away, Officer Stuart Rich returned to Stonehill for her successor, K9 "Gemma Rose," daughter of Kahnas and Raina. Gemma was instrumental in the highly publicized raid on "Deja Vu Night Club" in Highland Park. Left: Gemma at the Police K9 training academy in Indiana. "Maximus" Von Stonehill, owned by trainer Rick Napolitano, "The K9 Coach." 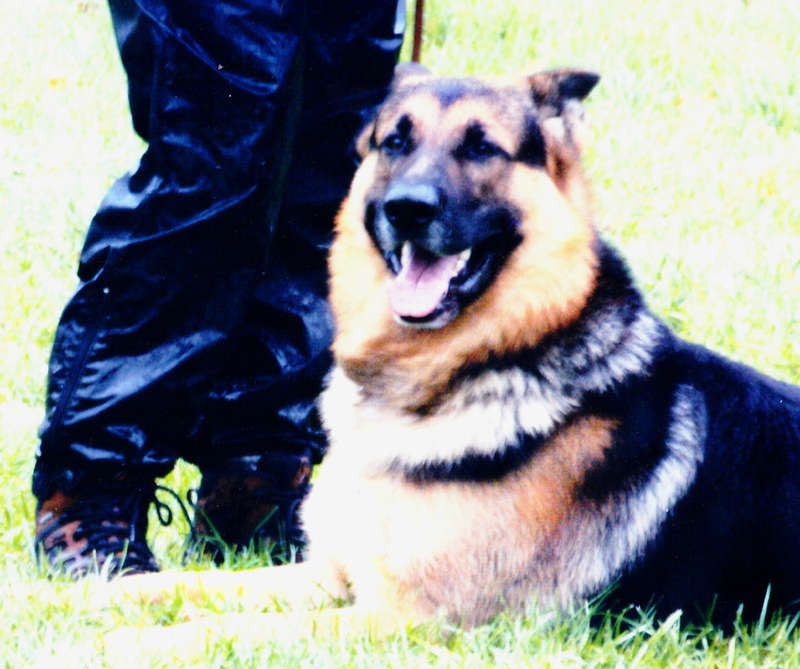 Rick says: "He was a hero to the end, intelligent, the best dog I ever owned. Lost him in 2012 at 11.5 years old. Thank you for a terrific temperament canine!" Left: Receiving his Sch1 High Protection award in 2003. Right: Winning 1st place at the Alpha Team Challenge in 2012 in the senior class. Our Kahnas's dam, a Blitz daughter. She is shown at left completing the final jump to earn her IPO1 title. Our Kahnas's sire, a Ressi/Maxamillion son, multiple times Sch3 and high in trial. After retiring from our breeding program, Britta went to the Kozlowski family. Although she had no training, she alerted one of the family members, that something was very wrong. They had a heart attack shortly after. The family realized Britta had been alerting them. Britta became a Cardiac Alert Dog, alerting when help was needed. Certified through Pets and People service dogs. "Six," as in "I've got your six," a mobility service dog for Sgt. Jeff Chaffin, a veteran of the United States Marine Corps who served in Iraq. Read about Jeff's amazing work here! Patrick is a mobility service dog in training, owned by Tanya O'Connor to help with her gait. He is showing great promise currently and has a gentle demeanor necessary for this line of work. "I just wanted to take a moment and THANK YOU so very much for the dedication and love you put into your puppies and Dogs. I knew getting a dog from you would be great, I just never knew it would over exceeded any expectations I ever had. It’s so hard to put into words but I love this dog with the deepest part of my heart he is more than I could’ve ever dreamt for. All of your dogs are beyond perfect. Thank you from the bottom of my heart for putting so much time in dedication into what you do." Two of our stud dogs, Kahnas (on right) and Vladimir (on left, owned by Marian Kiefer) visiting the VA hospital. 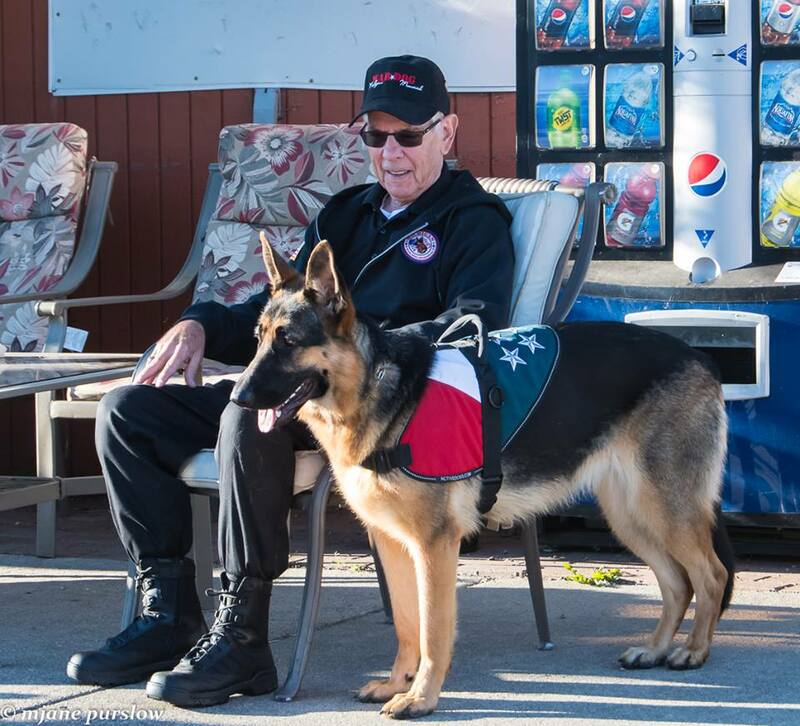 They are always a huge hit with the veterans, many of which served with German shepherds. Our own therapy dogs Ona, Bravo, Raina and Kahnas. Not pictured: Retired therapy dog Raven. Our own, "Raina" visiting students at Michigan State University's library for the "Paws for Fun" event. This event was set up to de-stress students during finals week. Therapy dog, "Baron," a Cara/XiaoBao son. "Sasha" owned by Julie Dubie. Maximus at left. Izye at right. Owned by the Barnhart family. Tasha, a Grissa/Bravo daughter owned by the shearer family in Connecticut. "Zander," a Yahna/Kahnas son and one of our current stud dogs. He is owned by Valli Metro. "Maisey," a Yale/Bravo daughter. She is owned by Sandy Lacross. Maisey is the resident therapy dog at Montcalm Care, where she comes in to work daily. "Quantus," one of our stud dogs, visiting with students at Michigan State University for stress relief during finals week. He's a favorite for his bubbly demeanor and playful antics. *Students faces have been edited for their privacy. "Hero," one of our stud dogs, offering his belly for rubs at a local event he was visiting at. As you can see, he drew quite the crowd. Invited and participated at the Eukanuba National Invitational Obedience Championship Trials. Raina earning the first leg of her CD, taking second place in the process! 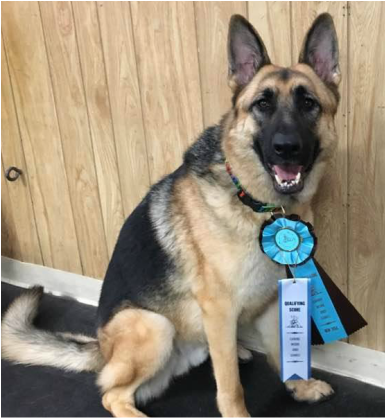 "Geyer" Bier Bonita Kasm von Stonehill CD RA CGC TKP (Shara/Kahnas son) earning his CD in AKC Obedience, taking second place in the process! 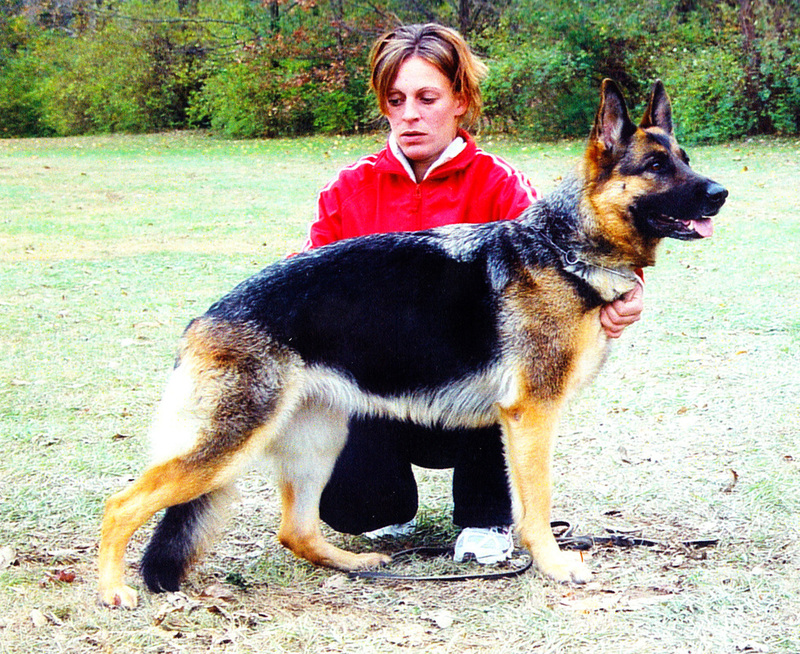 Geyer is owned and loved by Gail Spence who also competes him in AKC Rally and agility! Hero earned his CD, nearly sweeping his class with 2 first place wins and one second place finish. 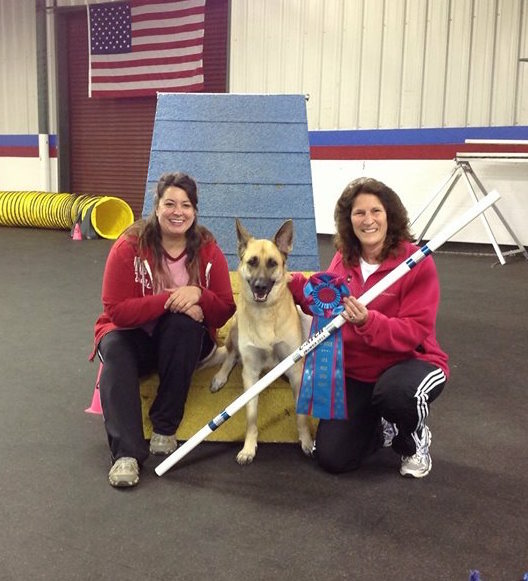 She finished 3rd at the 2014 Agility Nationals in Missouri! Ziva is owned by Vicki Haviland. 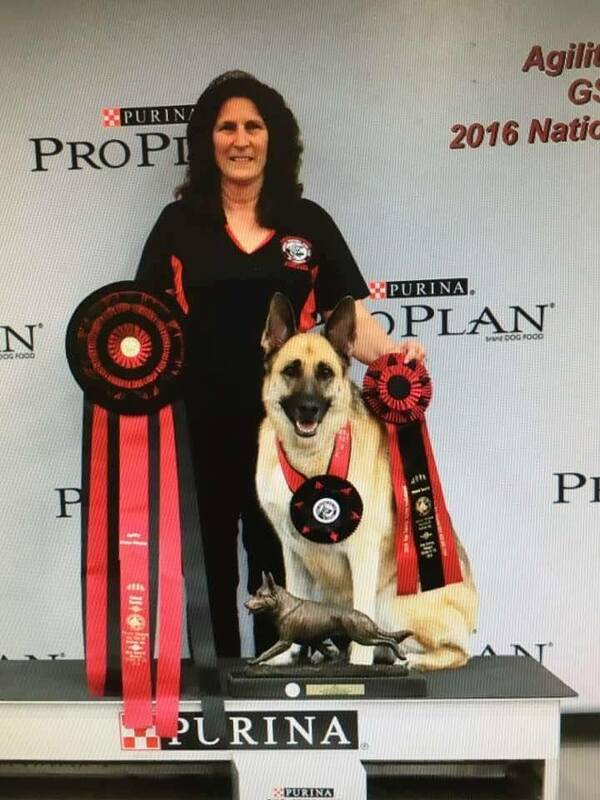 Ziva took the title of Victrix at the 2016 German Shepherd Nationals! Below is an article from the German Shepherd Dog Review magazine.